Mexico sometimes gets a bad rap as a dangerous country, unsafe for visitors. It’s true that there is drug crime and violence in Mexico, but that is the sad truth in many, many countries. And as is the case many other places, there are some spots you’ll want to stay away from but so many others that are a dream to visit and travel through. Merida is one of them, a place to experience authentic Mexican culture and see some fascinating sights while you’re there. And it’s a bonus that costs here are relatively inexpensive, with hotel rooms being available for as low as $42 a night. 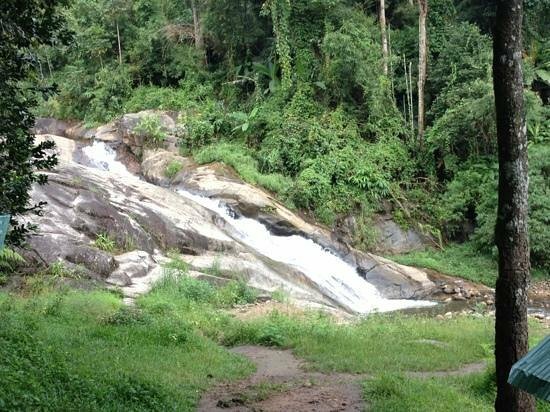 Here are some of the top things to see and do when you’re visiting Merida. Here you’ll see authentic ancient ruins of the Yucatan, and as this is a less touristy ruin sight than others in Mexico, you may end up having the place mostly to yourself. This means there are less hawkers and vendors plying their goods, so it’s really just you and this beautiful piece of history. The reason to visit this landmark is to see the incredible floor-to-ceiling murals that are housed within the Governor’s Palace. 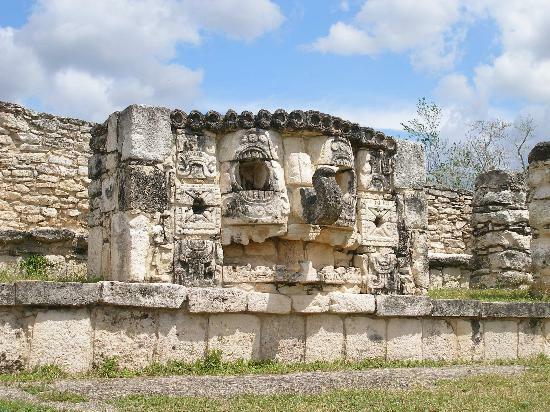 This is a beautiful and engaging way to learn the history of the Yucatan, and gives more weight to the emotional experience of your stay in Merida. This is not the most popular stop on the tourist trail, and that’s really part of the appeal of this place. Situated only a short walk from the Grand Plaza, it’s worth breaking away from the standard spots to spend some time perusing the folk art here. The collection is found in a restored historic home, adding to the feel of intimacy at this small collection. Located on the south side of the Plaza Grande, you can easily take a stroll to see this historical sight after spending some time at the Museo de Arte Popular or vice versa. This house was constructed in 1549, and the original purpose was as a home for soldiers. It later became a private family home, and today, visitors can wander the house and appreciate the interesting facade. Make time in your itinerary to visit more ruins – this time a Mayan structure that was believed by a Spanish historian to resemble a European monastery. The building appears to have possibly been a school but the name is misleading, as the building was not home to an ancient order of religious sisters. The name of this one is pretty self-explanatory, and you’ll want to drop by here to learn all about the interesting and unique city you’re visiting. The exhibits will take you through the different periods of Merida’s history, as an ancient Mayan enclave, to its days under Spanish rule to its present-day status as a cultural treasure. 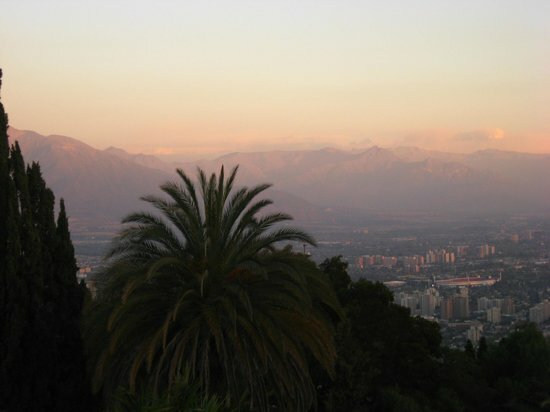 Santiago, Chile, has become a hotspot in recent years, not only for tourism but for entrepreneurs as well. Thanks to the Start-Up Chile program, which helps burgeoning enterprises get off the ground, Santiago has taken on a new role in the international scene. It’s a great place to visit simply as a travel as well – rich in history and culture, plenty to do and lots and lots of great Chilean wine to enjoy. A trip to Santiago can include all of these and you can experience the multi-faceted city in all its glory. The following are five must-see places while you’re in Santiago. TripAdvisor users rank this the number one attraction to see in Santiago. It’s a fairly new establishment, having opened in 2010, but it makes a big impact on visitors. The exhibits lead visitors through the terrors of the Augusto Pinochet regime and include testimonials, articles and other documents that give those unfamiliar with Chilean history a sincere understanding of the country’s past. Audio guides are available in different languages. 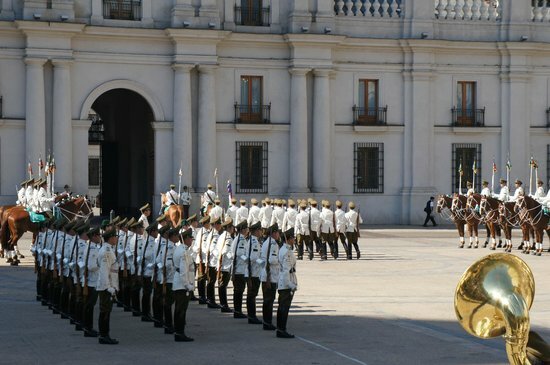 This presidential palace is huge – it covers an entire city block – but you won’t have to allot too much time for it because visitors are not allowed in. So what’s the point of going? You can witness the changing of the guards ceremony each morning, an event that certainly warrants a few photos and past visitors have reported being able to snap a few photos with the guards themselves. It’s worth seeing for that alone and to admire the beautiful design of the building. Take a guided tour through the hideaway home of the famous poet, and learn not only about the man himself, but about Chilean history and more about the Pinochet years. This is an intimate experience that allows you to glimpse the life, tastes and ideas of a literary giant and take a rare peek into his private life. You can book in advance to avoid waiting in long lines. You can really work up a thirst while touring, so why not take a day to relax, unwind and get serious about some wine? The Casablanca Valley is comparable to California’s Napa Valley, and you can tour the local wineries, sampling their products and luxuriating in this gorgeous valley, surrounded by the stunning mountains. What better way to see the sights and get some you time in as well? This is a great green space at which to relax and do some souvenir shopping. If you’re not feeling particularly spry, don’t worry, there is a train you can take to the top. However, this hill is quite walkable so you can hoof it or bike up for a bit of exercise. However you choose to do it, just make sure to get up there for a bit of nature and a great view of the city. When planning a trip to Australia, Sydney is often the first place on people’s lists. But Melbourne is usually not far behind, nor should it be. Though the two cities maintain a rivalry, both have great cultural offerings, not to mention a great quality of life and plenty of nightlife and entertainment to keep you busy well into the wee hours of the morning. 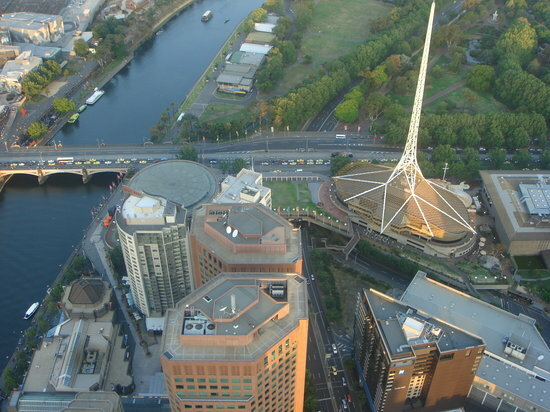 Below is information on some of the things to do and places to see while you are in Melbourne. Keep in mind, there is so much more to the city then what is listed. Travelers are surprised by the variety of different activities that range from places to dine and drink to the best activities to enjoy and make the most of your time here. You can find a number of tourist attractions to visit, in addition to finding places to stay in Melbourne on Expedia. You can also search online to see what is near the more populated areas around town. Step into Australia’s oldest art gallery, which opened in 1861, for a taste of the country’s culture, art history and aesthetic. In addition to the much-praised Monet’s Garden section, there are also exhibitions on Asian art that are said to be quite good. For convenience, you can book tickets online to avoid waiting in lines once you arrive and take an audio tour to fully understand the significance of the works on display. Though it may not relate to Melbourne culture alone, this gallery has a number of interesting and engaging exhibits for movie lovers from all over the world. Past visitors have reported seeing relics from the set of classics such as Gone With the Wind and Wizard of Oz. From the popular costume exhibit to the interactive components, this is a truly worthwhile and enjoyable experience for visitors of all ages. In order to understand the current culture and dynamic population of Melbourne, as well as how it came to be that way, stop by the Immigration Museum. Through a series of fascinating exhibits, you will come to understand the many groups that have made their way to Melbourne and have come to make up the diverse demographic of the city. 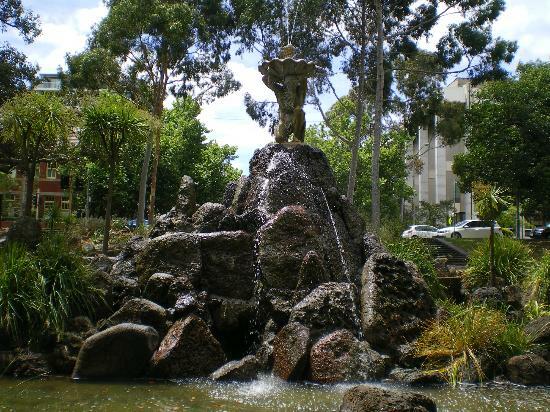 If you need a break from all the museums and exhibits, however great they may be, spend some time at Fitzroy Gardens, one of the city’s finest green spaces. There are numerous interesting spots to see within the grounds, but it’s great even just for taking some time out and observing the people of Melbourne going about their days. Those with an aversion to heights may not be able to stomach this one, but even for them, it’s worth a try. This is the highest vantage point in the southern hemisphere, according to the TripAdvisor owner description, and has a glass cube that projects three metres out from the building – and those brave enough can stand in it. This is a true thrill and should not be missed while visiting Melbourne. After hoofing it around the city to see the sights, you’ll appreciate it the aerial view even more. Making the most of Washington, D.C.
There’s no doubt that the election of President Barack Obama made Washington, D.C., a more glamorous city to live in and visit. What is often seen as a city for politics nerds became cool with his election, and glamorous thanks to the renewed interest of not only young people eager to be part of change but celebrities who threw their support behind the president. While the glamour quotient still isn’t quite as high as it is in, say, New York City or Los Angeles, Washington still has plenty of offer, and plenty of beautiful people to mix it up with. There are some obvious stops you’ll want to make on our sightseeing tour of the District. Taking a White House tour and visiting the Rotunda at the Capitol building almost go without saying. It’s a somewhat surreal feeling to realize how close you are to some of the most powerful people in the United States, and the world. If you’re from the States, you can usually arrange a Capitol tour through your Representative’s office. Then of course there are the memorials – the Lincoln and Jefferson being the most popular. The Vietnam War Memorial is also particularly moving and worth spending some time at. The Jefferson is especially nice to see in the springtime, when the cherry blossoms are in bloom. This is actually the nicest time of year to be in DC in general. The entire city has a cheery atmosphere as the chipper pink blossoms brighten up even the most stressful days – and there are plenty here. 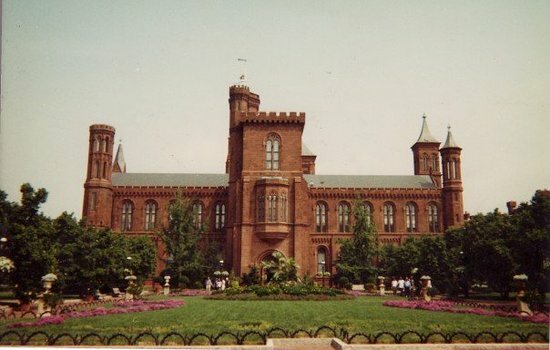 The Smithsonian is of course a must do, as is the Air & Space Museum. While some may balk at following such a traditionally touristic path, these are popular for a reason and you’d be remiss to skip them. Nonetheless, there does come a time for breaking away from the tourist trail and one great way to get the vibe of a city is to check out its nightlife. You can head to the Capitol Hill bars if you’re eager to rub elbows with political consultants and congressional staffers, but some of the more interesting nightlife happens in other quarters of the city. The H Street corridor has seen a great transformation in recent years, from a sketchy neighborhood you wouldn’t be eager to wander around in to a fun, hip area with an eclectic mix of bars and restaurants. You can never go wrong at Dupont Circle, where you can shop, dine and drink all within a few blocks’ radius. There is a great mix of bars and clubs around here, so start the night early so you can take it all in. Georgetown is a great area to go out in as long as you’re OK with being surrounded by preppy college kids. There are some fun bars and great restaurants here, especially those on the waterfront, but bring a thick wallet because nothing in Georgetown comes cheap. The U Street corridor is where you’ll want to go for great live music. This is a historically jazz-centric neighborhood and it’s still where you’ll find some of the best musicians in the city jamming together. And for just plain old debauchery, make your way to Adam’s Morgan, where you’ll find all kinds of opportunities to relive your college days, from dive bars to late-night pizza joints. A trip to Egypt is, for most people, a once-in-a-lifetime experience and a genuine dream come true. Years of learning about the mysteries of the pyramids culminate in an amazing experience of actually standing before these famed, ancient structures. The city of Luxor holds an abundance of treasures for history buffs and travelers, and, though many of these sights are laden with tourists and vendors who are all-too-eager to scam you out of a few extra dollars, this city is still absolutely worth spending some time in. Egypt is well-known for vendors who will call out to you, adamantly offering their services and trying to rope you into hiring them or signing up for their tours. In order to avoid being scammed, research costs for not only sightseeing, but food and drink as well, and talk with fellow travelers in your hostel or hotel about what they’ve seen. They will usually give you some good perspective on what is worth doing and how to make the most of it. For example, visiting the temples and pyramids at a certain time of day may make for a less crowded experience, or they might already know a good tour guide they can recommend. This one is a double whammy, since the natural setting for this monument is just as breathtaking and mesmerizing as the temple itself. Lonely Planet describes the scene this way: “The eyes first focus on the dramatic rugged limestone cliffs that rise nearly 300m above the desert plain – and that’s before you’ve even seen the temple. Although this temple is not included in the standard ticket price for most temples, it is worth shelling out the extra cash. 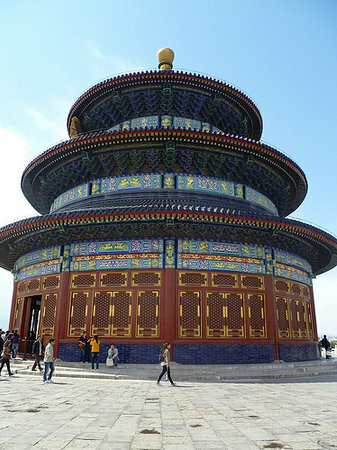 Visitors who have been the temple have praised the still vibrant wall and ceiling markings and elaborate nature of the tomb. 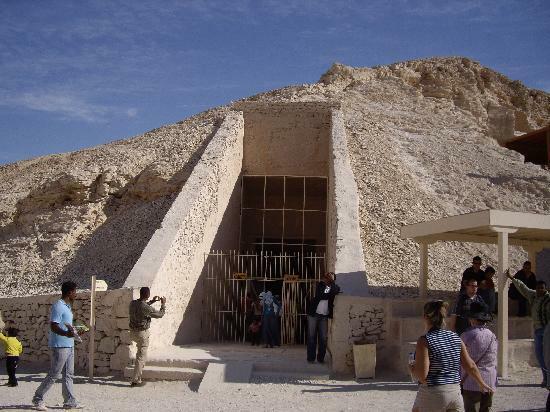 According to TripAdvisor, the tomb was originally commissioned by Ramses V, but was improved upon by his successor. This astonishing structure was built in honor of the traditional Beautiful Feast of Opet. The likeness of Ramses II can be seen on the enormous statues built to commemorate him that adorn the temple, and the towering columns are also a sight to behold. In the small village of Gurna, wander through grounds that house the remains of 400 nobles from ancient times. It’s difficult not to imagine what these people were like, what their personalities were, who they lived, and how they played politics in ancient Egypt. In a sense, it is like walking through a valley of ghosts. Put everything in context and learn how the serious work of mummifying a body is done. This museum is reportedly a small one, although many who have visited say it is well worth taking the time to see it, and peruse the artifacts and relics that are housed here. And the museum does not disappoint when it comes to its name – the mummies of humans and animals are on display here.